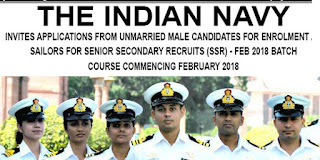 Senior Secondary Recruitment of Sailor in Indian Navy for February 2018 batch. Unmarried candidates can apply in 2017 and course will be commencing in Feb 2018. 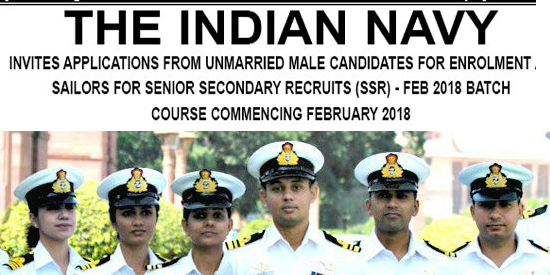 Unmarried Candidates who wish to apply Indian Navy as a sailor must follow given below instructions. Educational Qualification:- Candidates who have qualified 10+2 examination with Physics and physics are illegible for sailor post. Pay scale : Pay Band Rs 5200-20200. In addition they will be paid Grade Pay @ Rs 2000/- plus MSP @ Rs 2000/- plus DA (being revised as per 7th CPC). Selection criteria :- candidates who perform better in written test, PFT and fitness in medical examination will be short listed for merit. Important date :- Candidates are requested to apply online on official website www.joinindiannavy.gov.in from 12 Oct 17 to 15 Oct 17.
if i was late to fill form of indian navy ssr. then there is any way to fill form after date.